Discover a new level of front-office productivity with the fi-6130 document scanner Enhanced with innovative features, the Fujitsu fi-6130 scanner offers outstanding price/performance value in a compact footprint, conserving both space and budget. With duplex scanning performance of up to 80 images per minute in monochrome and grayscale, the fi-6130 also delivers uncompromised high-resolution performance of up to 60 images per minute in color at an astounding 300 dpi. Engineered with one of the most advanced paper separation features in their class, the fi-6130 is the first workgroup scanner equipped with reversing roller technology*, resulting in exceptional feeding reliability for an even wider variety of document weights. Furthermore, the automatic document feeder (ADF), capable of scanning documents up to 10 feet long, is also robust enough to feed up to three hard cards continuously or an embossed card up to 1.4 mm in thickness. Additionally, the fi-6130 harmoniously combines the security of Ultrasonic Double Feed Detection with the efficiency of Intelligent MultiFeed Function (iMFF) so that intentional double-feeds, such as a taped receipt or sticky note, can be manually bypassed while double-feed detection is enabled. 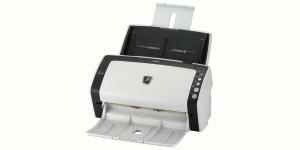 The Fujitsu fi-6130 workgroup scanner conveniently includes everything in the box to get organizations up and scanning. With the full version of Kofax VRS Professional, Adobe Acrobat Standard, and ScandAll Pro software, users get image enhancement functionality as well as the option of scanning directly to PDF, file, print or batch. And the one-year Limited Warranty, along with eligibility for our Advance Exchange Program, provides peace-of-mind. For full details on the Limited Warranty and on all service programs, go to www.ImagingService.com or call (800) 626-4686.